Sea Buckthorn Insider | Straight from The View—Sea Buckthorn great for Skin, Hair, and Nails!!! Straight from The View—Sea Buckthorn great for Skin, Hair, and Nails!!! Everyone wants luxurious, healthy and smooth hair, and strong skin and nails, and millions of dollars are spent every year in the cosmetics industries on products advertising to make skin look and feel younger, hair fuller and nails stronger. Try adding Sea Buckthorn to your diet for your beauty needs. Here’s more proof that Sea Buckthorn really is that ancient Oriental beauty secret everyone’s been wondering about. On the “The View’s”, “7 New Super Foods for Women, which aired in December 2011, Sea buckthorn was featured as a food that would enhance women’s healthy skin, hair and nails, as well as, increases healthy energy and immune support. 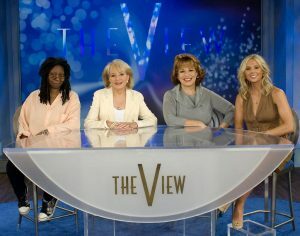 Dr. Lindsey Duncan stopped by “The View” to tell them that women should be paying attention to Sea Buckthorn and its benefits to the aging process. Sea Buckthorn is that fruit packed with essential fatty acids Omega 7, 3, 6 and 9. Omega 7 is hailed as a rare, special nutrient that may protect, replenish, moisten and restore the skin. This is what promotes the proper cellular function and health that later leads to beautiful hair, skin and nails. It is also a major player in the creation of collagen, which is essential because as we age, our bodies produce less and less collagen. Less collagen production leads to skin issues and wrinkles, but when you use Sea Buckthorn oil, your problematic skin blemishes will easily go away, naturally. No excessive make up or lotions or creams needed. This makes it a very effective beauty and delay-aging product that is good for skin, peptic, duodenal, urinary, hair and cardiovascular health with pro-natural healing properties including infection and inflammation response. Click here for further information about sea buckthorn and anti-aging. Containing 10 times more vitamin c than oranges, the highest concentration of Vitamin E among fruits, and all the anti-oxidants needed to keep our internal organs healthy inside and out, Sea buckthorn is a wonderful fruit can that can restore our external appearance just as favorably. Testimonials from across the internet praise Sea buckthorn as “a miracle berry”, most reporting clearer skin. A user reportedly used it for her dog and exclaims, “Her eyes are now clear, she is alert and has energy, and, her coat is shiny and healthy!” Another says, “I use Sea buckthorn Oil for all my skin care, cracks, dry skin, cuts, burns, itching, wounds, sinus, etc. The same day I use it I can see the difference. When I had pain in my tongue, gum, I applied 1-2 droppers at bed time by the next morning it wouldn’t bother me anymore.” Check out our sea buckthorn reviews page here, and be sure to leave your testimonial too. Sea buckthorn can be used externally to treat all hair types from dry, itchy scalp, and thinning. It’s also known to relieve acne and Rosacea, soften hard cuticles, and strengthen chipping, brittle nails. Add a few drops of the oil to your conditioner after shampooing to reveal a glossier mane. And Sea Buckthorn is an inexpensive way to give your facial and body moisturizer, and bath oil a spa-type boost. Liquid supplements and soft gel capsules are becoming increasingly more abundant at stores and online. Learn more about different sea buckthorn products here. Sea Buckthorn is an amazing fruit. If you are looking for a great skin care line that also benefits hair and nails, check Sea Buckthorn out. It’s notorious as a skin and beauty fruit that can help you avoid signs of premature aging, as well as help fight off common skin ailments like psoriasis and eczema. 2 Responses to Straight from The View—Sea Buckthorn great for Skin, Hair, and Nails!!! How is it used for hair growth? How is it applied. Do I purchase the oil spefically? We suggest taking a product that contains both seed and fruit oil. Taking the oil internally for a few weeks is usually all you need to support your hair. Both kinds of oils come in dropper bottles from different brands as well. If you want to do a treatment of the dry ends of your hair, mix sea buckthorn berry oil with coconut oil and let the oils soak in. After about 30 minutes you can wash and condition as normal. That won’t stimulate hair growth but it will help hydrate the hair to prevent breakage. We did see a new product that combines sea buckthorn oil with biotin from one of our sponsors- that’s probably going to be the best solution. As far as we know there are no other products that contain those ingredients and we think that it would be great for hair.